The first question: How can you tell if you do indeed have this kind of floor?Look at the areas where the finish is gone. Does the grain of the bare wood match the grain of the undamaged part of the floor? If it does not then you have a faux wood floor. Look at the detail of the dresser in the picture to your left – looks real doesn’t it? So how do you “repair” worn faux finishes? It isn’t easy – and it takes patience but it’s worth it. 1. First of all you need to clean the floor. Vacuum then wash the floor thoroughly. This is where it gets tricky. It’s probable that your floor has several coats of wax – these need to be removed because nothing will stick to wax. The problem is that in order to strip wax you may inadvertently remove the finish as well so it’s important that you test this. This is the most important part of the process. Try it in an inconspicuous part of the floor – even if it isn’t damaged. What you are trying to do is find out how to clean the whole floor at this point. I would start with dish soap and water and see what happens. If the water forms into a little ball or “beads” then there’s a good chance there’s wax on the floor (or at least on that part of the floor). Try a slightly stronger solution of soap and warm water and note the change in the bead of water. I would then probably try a weak TSP solution. (Trisodium phosphate). Now this can get tricky – people use it all the time to strip wax off floors but it could dissolve the finish too so test the solution little by little. If you are using a commercial wax stripper start with a half – strength solution. Use a bit of cotton or a Q tip. Look at what comes off – does it look like the finish or is it just grime? Can you see why this step is so important? It tells you what you need to do for the rest of the floor. 2. Touch up the grain. Ok so let’s say that you have cleaned the floor- the wax has been removed and the surface is ready to accept the next step. Look at the detail above. 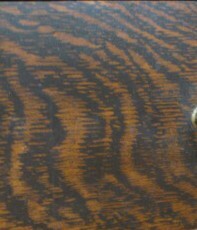 You can see it has very definite markings – typical of oak. Go to your local paint store and get wood coloured felt pens. I use Mohawk brand “Pro-Mark II”. These are specially formulated for touch ups on wood and they come in different colours to match your wood. Pick two colours that are slightly darker than the colours of the wood grain you have. Study the grain then paint your light and dark colours in the design created by the grain. Do this in all the spots on the floor where the finish has rubbed off. You will find that there is a difference in the texture of the bare wood compared to the part of the floor that still has its original varnish. That will be minimized with the last step. Remember this is a cosmetic touch up to preserve what you have – it will not give you a floor that looks new. 4. The last step is to apply a protective top coat over the floor once you know your finish. Much of the furniture I worked on was finished with lacquer so I put a coat of Deft Oil on it and it worked fine but a floor finish needs to be more hard wearing. Speak with your local paint and floor professionals to figure out the best finish to use over your floor. Quite honestly the safest thing to do would be to simply wax the floor with a good old fashioned paste wax. Try to get one of those vintage floor polishers – they work great. I have used one on my own hardwood floors. Oh, and by the way keep pets (especially dogs) off the floor if you can. Good luck!